When it comes to design, everyone is familiar with the phrase ‘form follows function’. But at Harley-Davidson® we have realized over the years that to continue engaging our customers, form must follow emotion as well as function. In recent years, the classic ‘Harley-Davidson® look’ has taken center-stage with the cruising-motorcycle community all over the world. The iconic Harley-Davidson Fat Boy which was designed to represent the Hardtail choppers of the 60’s, 70’s and 80’s is a clear example of how the magic of proportion and style can create a legend. 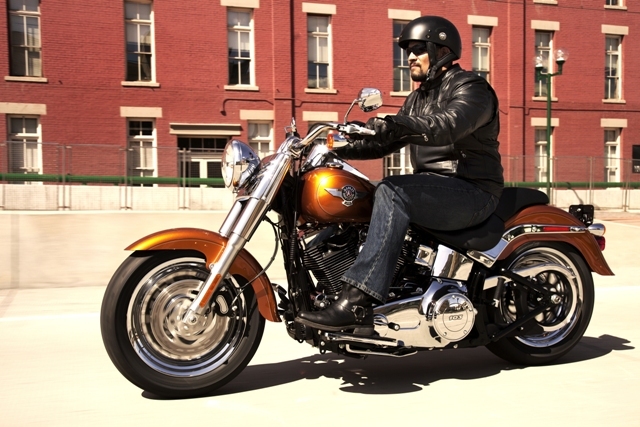 Even after more than two decades, the Fat Boy is the quintessential symbol of raw power and old-school style. Harley-Davidson Fat Boy’s rawest of raw custom has made it a vital part of the motorcycle history. Even after more than two decades, it rules millions of hearts around the world by reminding them of an era of customization and personalization when less was more. The current Fat Boy is a constant reminder of the original spare frame. The motorcycle flows seamlessly into a straight line from the fork pivot to the rear axle. The Hardtail look is so perfectly blended into the Softail model that it has evolved into nothing less than a piece of art with an untamed mechanical appeal. The unrestrained beauty of the mechanics of the Fat Boy has places it among the most celebrated motorcycles of all time. The monochromatic paint scheme and the heart-pounding rumble of the Twin Cam™ has mesmerized an entire generation of motorcycle enthusiasts. Each Harley-Davidson Fat Boy is as unique as the logo on its tank, which has remained the same throughout its history. The year 2015 marks the 25th anniversary of the Fat Boy. After winning the hearts of millions in the 1991 movie: Terminator – Judgment Day, it is back as the ultimate machine of choice of Arnold Schwarzenegger in the latest installment of the franchise: Terminator – Genisys.